Recent years have seen a rejuvenation of interest in studies of motivation–cognition interactions arising from many different areas of psychology and neuroscience. 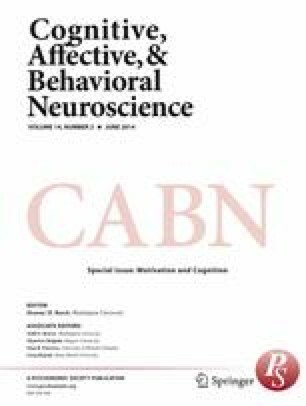 The present issue of Cognitive, Affective, & Behavioral Neuroscience provides a sampling of some of the latest research from a number of these different areas. In this introductory article, we provide an overview of the current state of the field, in terms of key research developments and candidate neural mechanisms receiving focused investigation as potential sources of motivation–cognition interaction. However, our primary goal is conceptual: to highlight the distinct perspectives taken by different research areas, in terms of how motivation is defined, the relevant dimensions and dissociations that are emphasized, and the theoretical questions being targeted. Together, these distinctions present both challenges and opportunities for efforts aiming toward a more unified and cross-disciplinary approach. We identify a set of pressing research questions calling for this sort of cross-disciplinary approach, with the explicit goal of encouraging integrative and collaborative investigations directed toward them. The MOMCAI group refers to the attendees of the Mechanisms of Motivation, Cognition, and Aging Interactions conference, held in Washington, D.C., on May 2–4, 2013, who were directly involved in specifying the content of this article from conference discussions. The attendees, beyond the listed authors, were Stan Floresco, Michael Frank, Ulrich Mayr, Erik Asp, Sarah Barber, Brittany Cassidy, Jong Moon Choi, Michael Cohen, Reka Daniel, Kathryn Dickerson, Natalie Ebner, Tammy English, Natasha Fourquet, Nichole Lighthall, Brenton McMenamin, Srikanth Padmala, Angela Radulescu, Kendra Seaman, Brian Smith, Mieke van Holstein, Steven Stanton, Isha Vicaria, Tara Queen, and Lisa Zaval.